Feminists for Life (FFL) President Serrin M. Foster will moderate the 20th annual Pregnancy Resource Forum at Georgetown University at 8 PM on Thursday, October 15 at White-Gravenor Hall in Room 213. 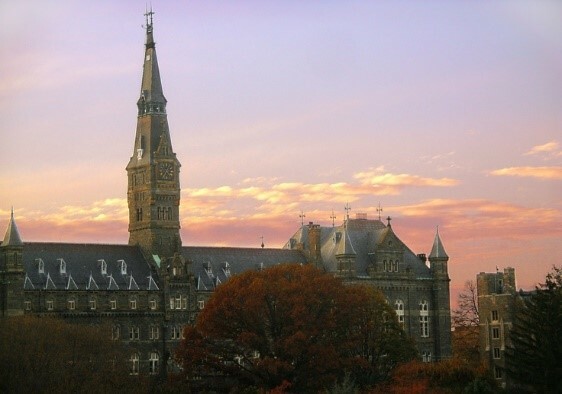 The forum will build on two decades of groundbreaking work by students and faculty at Georgetown University (GU) to make the school a better place for pregnant and parenting students and to help FFL’s efforts to take this program across the nation. After an FFL board member shared her experience searching for on-campus resources then suffering a miscarriage while attending another Washington, D.C., university, Foster worked with clinic staff from that university and a GU alum who was the executive director of the Northwest Center, a pregnancy care center and maternity home serving pregnant and parenting women in a poor section of DC. Six hundred and fifty kits were sent across the country to health centers at top colleges and universities. But more was needed to create a culture that supported pregnant women, parents and birthparents. Foster went to GU-Right to Life leaders (who had previously hosted her for her speech, “The Feminist Case Against Abortion” lecture) to take the next crucial step. In January 1997, Foster moderated the first-ever FFL Pregnancy Resource ForumSM at Georgetown University hosted by GU-Right to Life. She asked if women had the choice to have children and stay at Georgetown. At that time, a myth had been circulating that if a student was pregnant or parenting at Georgetown, she would have to drop out, which appeared to result in women having abortions or dropping out without completing the degree that could have economically empowered the mother and her family. Students and administrators first heard a letter read aloud by a GU-RTL leader. Though unwilling to share her testimony in person, she wanted others to know what drove her to an abortion. Foster led an inventory of resources available on and off campus. Goals were set and priorities established creating a blueprint for progress. The plan was presented to administrators. This first event established the model for schools across the nation. Colleges and universities have followed in Georgetown’s footsteps, inviting FFL moderators to their campuses, taking this crucial first step to open dialogue on their campuses. As Director of Health Education Services at GU and the only panelist to have participated every year from the beginning, Carol Day believes the forum is “an opportunity to let people know that there are students choosing to be parents and that the university will support that. It is a good opportunity to say ‘You might not think about pregnancy resources, but we do, and we’re trying to encourage students and let them know that pregnancy and parenthood is a reasonable option for them. '” Like Foster, Day has helped this model be adopted by others by sharing it with other members of JASPA (the Jesuit Association of Student Personnel Administrators). She has also shared this nationally via a “Paperclip” webinar. Soon after the first forum, Georgetown opened a daycare facility called Hoya Kids Learning Center. Within the first year, the department of Health Education Services offered free home pregnancy testing kits and a pregnancy hotline. Two years later a townhouse a few blocks from the gates of GU Georgetown University was designated for the use of student mothers and their children. Steps were taken to ensure that the home was safe from asbestos and lead poisoning and windows had appropriate locks. A “safety net” helps to ensure that no pregnant woman, expectant father, parent or birthmother will fall through the cracks of available services. GU-RTL started a volunteer babysitting co-op and continues to organize diaper drives for the local Northwest Pregnancy Center in addition to hosting the annual Forum. Over the years pregnant women, parents and birthmothers have participated in the forum, sometimes bringing their children. “Their participation has been essential in helping to identify the resources they appreciated and those they still needed and in helping to educate others on the campus that there is support at GU,” Foster said. Feminists for Life has taken this program to other campuses across the country that have in turn come up with more creative solutions tailored for their school. In 2010, FFL’s Pregnancy Resource Forums became the inspiration for Pregnancy Assistance Fund grants by the U.S. Department of Health and Human Services. Foster suggested a similar forum for the Republic of Ireland. In 1998 the conference was called “5,000 Too Many,” a reference to the number of women who sought abortions in England. Fiona Bruton moderated. Her husband, former Prime Minister John Bruton and Members of Parliament from both sides of the abortion debate attended. Foster was the only American invited to speak. 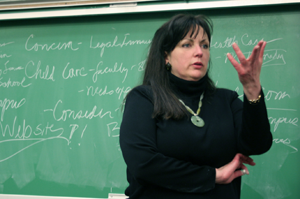 She shared the concept first implemented at Georgetown. Editor’s note: “H*ya” is the correct name for this group as it is not officially recognized by Georgetown University. Please visit our new website Raising Kids on a Shoestring for more resources for women facing unplanned pregnancies and their allies.